Recipe from Love at First Bite, the Unofficial Twilight Cookbook by Gina Meyers. Sink your fangs into this meat! Remove skin from tendars and wash and dry chicken thoroughly and pat dry with paper towels. In a large baking dish, pour oil and dip and roll chicken in the oil. In a large plastic resealable bag, place cornflake cereal, salt and pepper to taste and seal. Make sure all air is out of the bag, and crush cornflakes with a wooden spoon or a rolling pin. Next, take tenders one at a time and place in the crushed cornflakes, reseal plastic bag and shake until chicken is thoroughly coated with the crushed cornflakes. 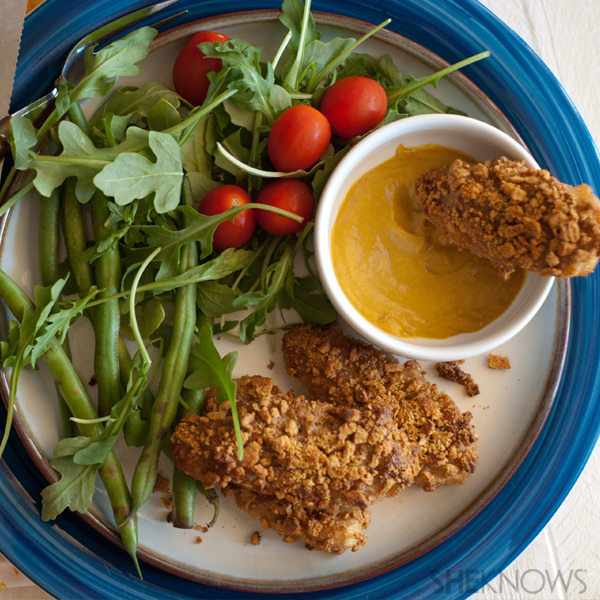 Place chicken tenders in an ungreased 8 x 11-1/2-inch baking dish and bake for 45 minutes, uncovered.